I managed to get a bit of time tonight and have updated the C5 registry to the 2nd edition. The links on the first post to this thread should work to go the updated version as well. Isn't that interesting our 2 scopes are 101 numbers apart ,My motors are also 11-79, heck they were most likely made the same day!! 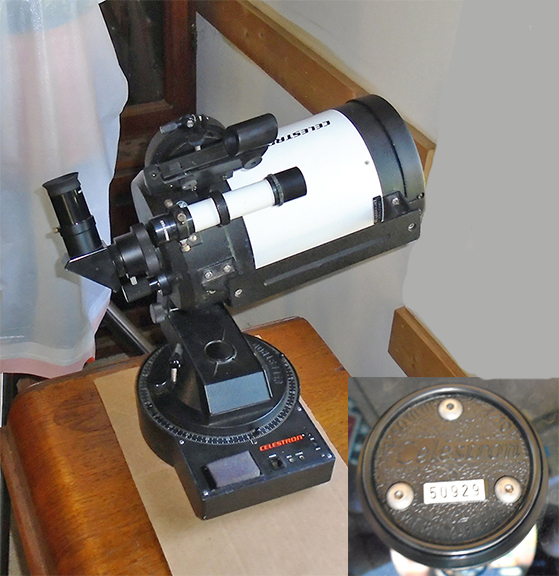 You have a much nicer small base and I have a large one.does your scope have the special coatings sticker? Edited by paul, 02 March 2015 - 09:51 PM. Hi Paul i noticed that yesterday after i posted my info. Any stickers mine had were gone when i got it at kind of an estate sale It had been sitting in a damp basement for a number of years in the trunk " I would guess 20 years at least and probably the orginal owner who had passed " you could say i rescued it. I cleaned the corrector plate and used compressed nitrogen to blow out some flecks from inside. I almost didnt even need to collimate afterward as i marked the paper shims and used auto polish to bring it to a shine. The motors even still work but the outside of them has a whitish oxcide built up but i am sure now the motors say 11/79. 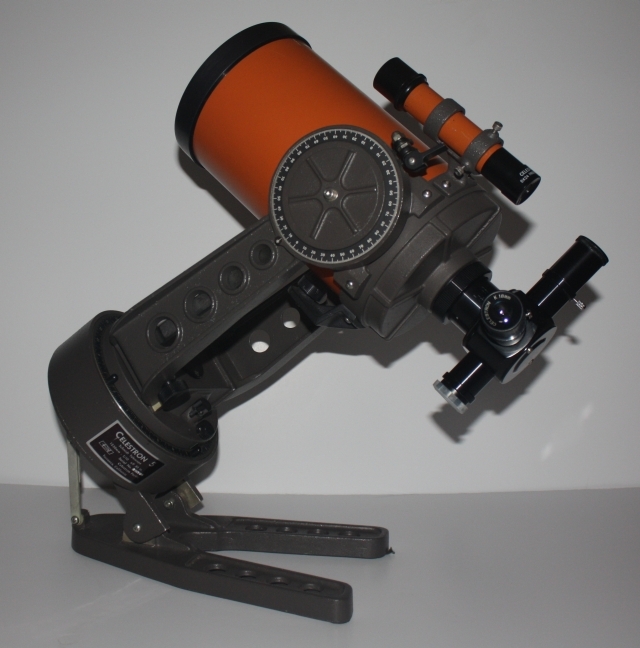 I didnt get any eyepieces though i did give them my number if any ever turn up. I am looking forward to seeing more numbers get posted this is really cool. Oh yea, i think the owner had been a photographer. Edited by eolian, 03 March 2015 - 10:56 AM. Edited by Martin Hoyle, 08 April 2015 - 03:41 PM. Add my C5 guidescope to the list. 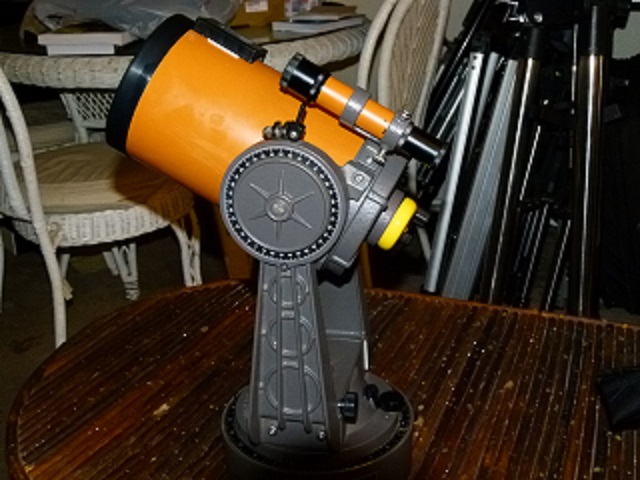 It's an orangetube with special tangent arm adapters on the tube and cell, and a 1/4x20 adapter. 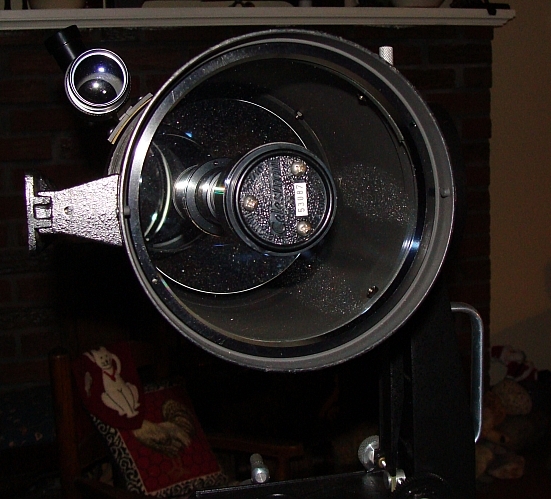 It came with a big finder (6x30) and uses a large visual back instead of a .96 opening. 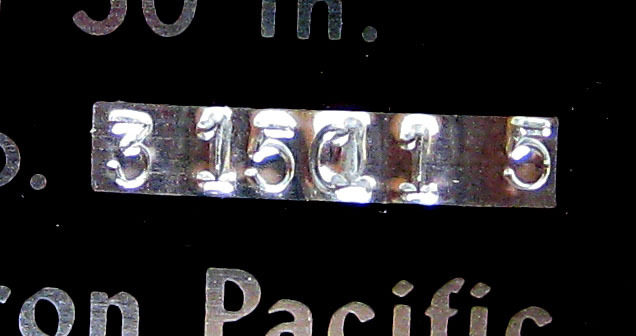 The serial number is 4 3436 7. Strange, huh? 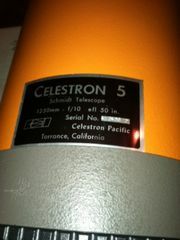 My newly acquired C5 seems to have a double stamp on the serial number, but I think it's 3 1501 5. Very nice. Welcome to CN and the classics crew! +1, love the thee colors on the second one and it looks perfect! Edited by A6Q6, 19 June 2015 - 08:20 AM. White C5+, StarBright Coating, Single Fork Mount, # 50929. Edited by Icebox, 15 July 2015 - 05:26 PM. Edited by Rick Huber, 08 October 2015 - 10:21 AM. oh, you experts, please tell me what year this is....I forgot to look at motors....will report back on them! 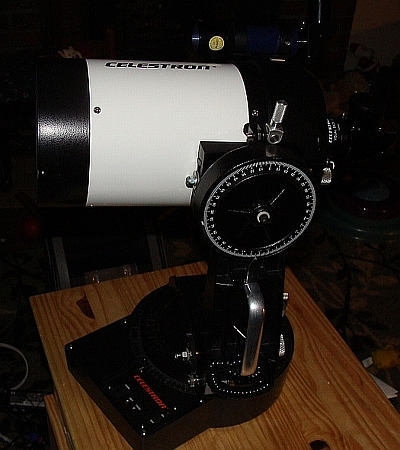 I have an update for the C5 registry, I purchased the C5+ and mount from Albert about 2 1/2 years ago, serial number 53087. So the registry can list CN Philip Levine as the current owner. 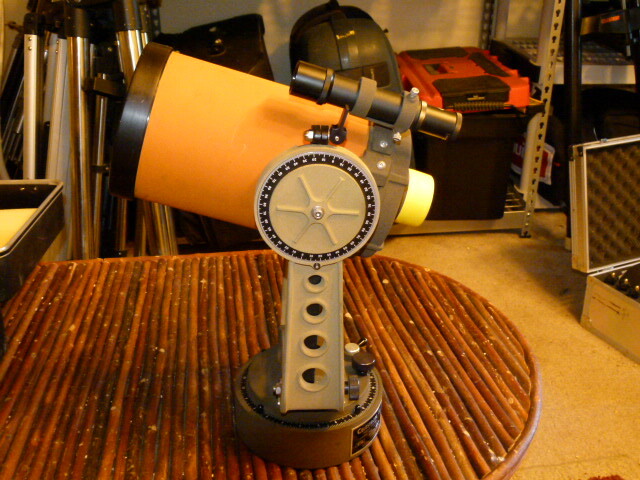 I did replace the finder scope with a more functional Meade right angle 6x30 finder. Short story for the C5 registry. Over the last two months, having been severely injured in an accident, I was bedridden most of my time. Things are getting better now, but ain't be fun. At all. I was obviously forced to put aside a long list of tasks. Some friends in this forum have been also affected from this. Thank you guys for having been patient with me. Really! 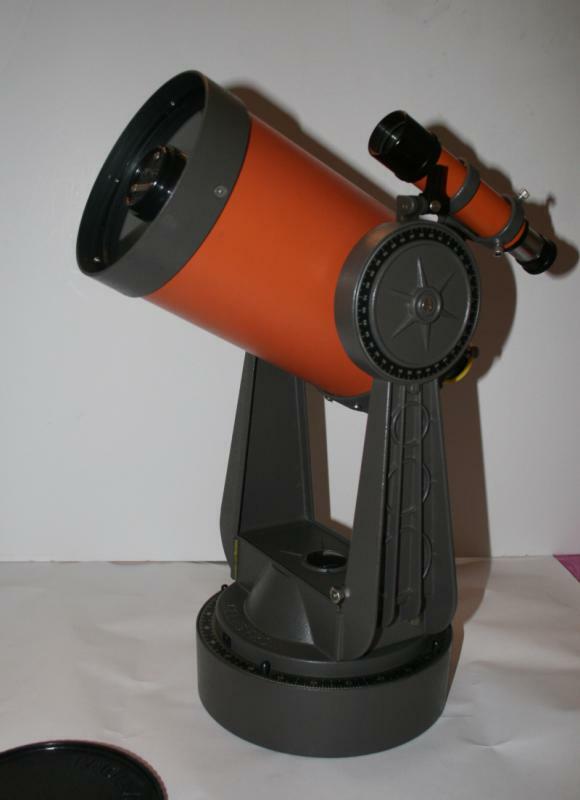 Anyhow, one of the very few things I was able to manage from bed was winning an eBay auction on a US-based (like basically all of them) Orange C5. So, as per the registry (and as far as I know) pebble finish means 1978. And the cute C5 I was aiming at was indeed advertised as a 1978 model. BUT, carefully looking at one of the images of the auction it was possible to barely read a serial # ending with... a "7"! 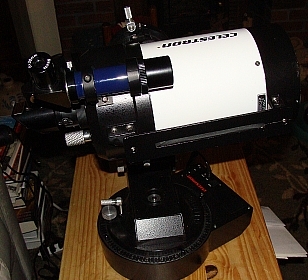 Mmmmm, so, a bridge model: optics from 1977 on a 1978-style OTA. I was definitely positive about getting it. So, I won the auction and, as usual (*), the seller refused to ship to Italy. C'mon guys, whats wrong with you?! Why on Earth everyone is supposed to be ready to ship to the US while it is so **** difficult to find someone kindly shipping overseas...?! Do you think it is nice for all of us, 6.9 billions living elsewhere in the world, to constantly read that "CONUS only" stuff...?! Be assured we don't bite! Anyhow, my friend Llazar in Chicago was so kind as to look after it: double shipping from Ohio to Illinois and then from Illinois to Rome (Italy). Llazar, if you read this, be assured that, next time we get together, you'll have fun at the commands of this little cutie. Eventually, after dealing with customs for 12 days, I got the package delivered nearby my bed. 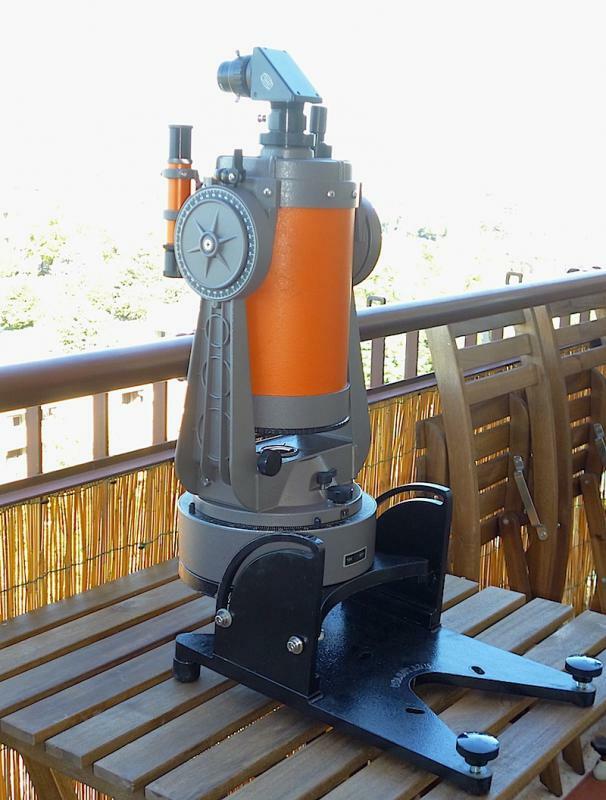 Of course I immediately started looking after this telescope, forgetting I was supposed to remain in bed. Result: my scares started bleeding... but that's another story. 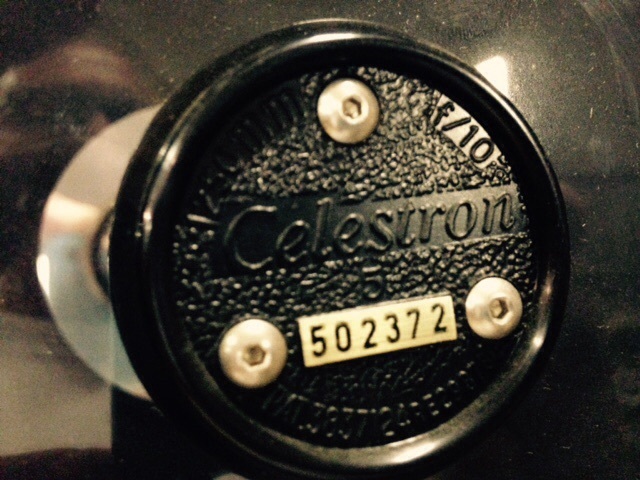 So, for the registry, here is the Model plate: Celestron Pacific, serial # 4 3359 7 (# 3359, 4th quarter of 1977). Motors (not shown) are indeed of November 1977 (11/77). Pebble finish in perfect conditions. Mechanics tight and precise. The OTA is effortlessly driven by its fork at very high powers. A slam in the back is dampened in less than a second. Edited by Max Lattanzi, 29 October 2015 - 10:51 AM. Main mirror looked OK, but the corrector plate was *really* fogged. It was not my original intention to open the OTA and clean the inside but I obviously had to do it. 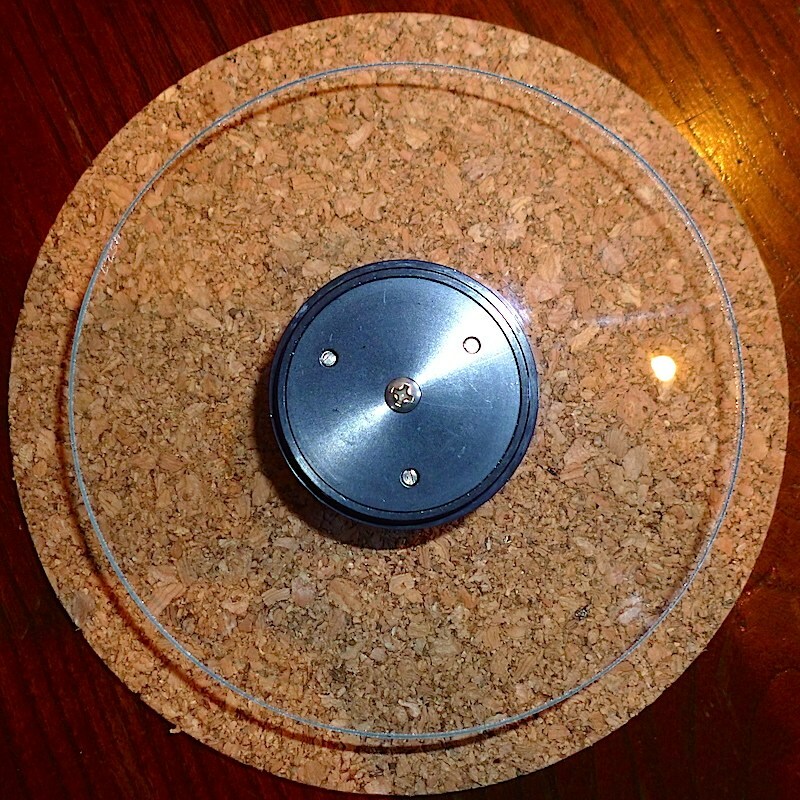 So, picture of the fogged corrector (fogged inside and dirty outside). 50th fork-mounted C5 OTA of 1977...?! Anyhow, the corrector got carefully and successfully cleaned. Here it is, totally transparent, after cleaning. Note that this OTA presents zero -- I mean ZERO image shift -- at 300x and beyond: it looks like you are focusing with an external focuser instead of using the right knob. 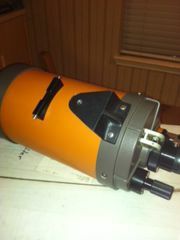 So, you will excuse me if I did not dismantled the main mirror (what I would usually do to re-grease any SCT). I preferred to play wisely: if it works, just leave it alone. But, as a matter of fact, next time I may do it just out of curiosity. Read on and you'll understand why. 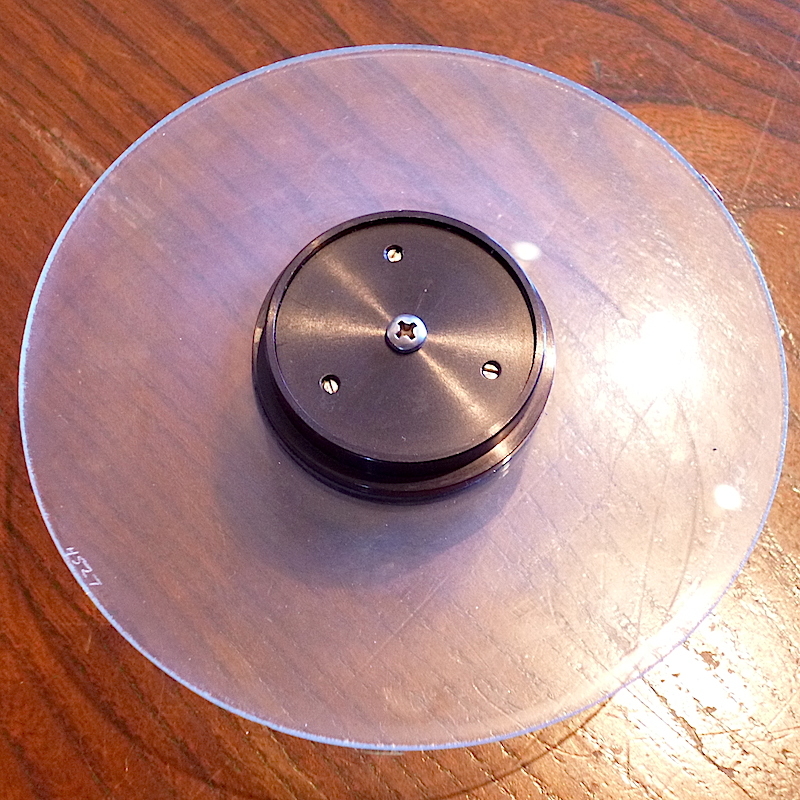 So, this is the beautiful OTA on its perfectly tuned (not by me) fork mount, sitting on a C5+ wedge. I know it is anachronistic, but I find it very handy. 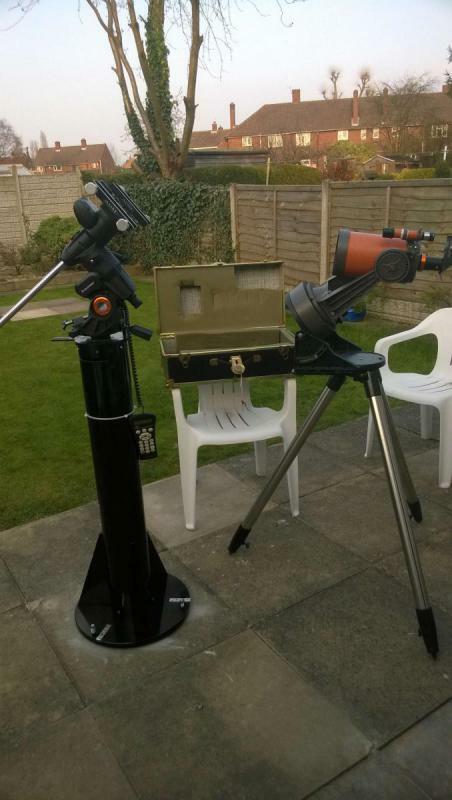 I have a wedge+tripod of the proper vintage but, in my present state, it is better for me to peacefully deal just with the C5+ wedge on a small garden table. The second evening (first one after cleaning), I tried again the optics. The first evening I was amazed at the zero image shift as well as at the zero (really zero) play of the fork. Tracking is perfect. Response to manual movements as well. But, although the initial impression on the spherical was positive, I wanted to check everything again with a clean corrector. So, second evening with clean corrector and three good hours of cool down (not actually needed, but it doesn't hurt). Confirmed: the spherical is very very good. Great. 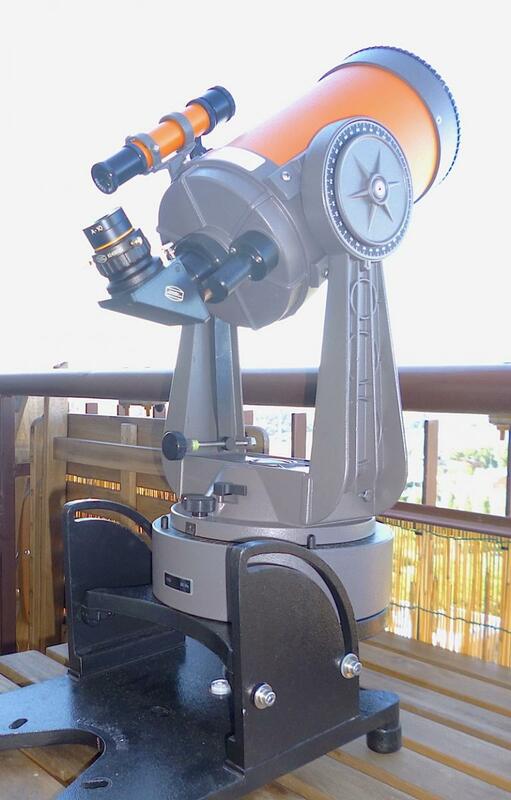 BUT, as it was the case during the previous night (an now more clearly) the star test showed a visible astigmatism. Very visible at high powers. I was using an excellent prism and everything was thermally-equalized. Just in case, I shifted to an equally excellent mirror. Same stuff. Identical sensible astigmatism. Mmmmmm, this is very bad news. When cleaning the corrector plate I did check and confirmed that the serial was, as usual, at 3 o'clock... but, since I did not actually take off the main mirror (as said, so as not to run the risk of spoiling the zero image-shift), I did not have a clear confirmation of the suggested correspondent optical position (that should be noted on the back of the mirror itself). Edited by Max Lattanzi, 29 October 2015 - 12:55 PM. Incidentally, the OTA bears this sticker on top: "OHIO S.B. 170 in cooperation with the Cleveland Public Schools". Maybe someone knows the meaning of this. 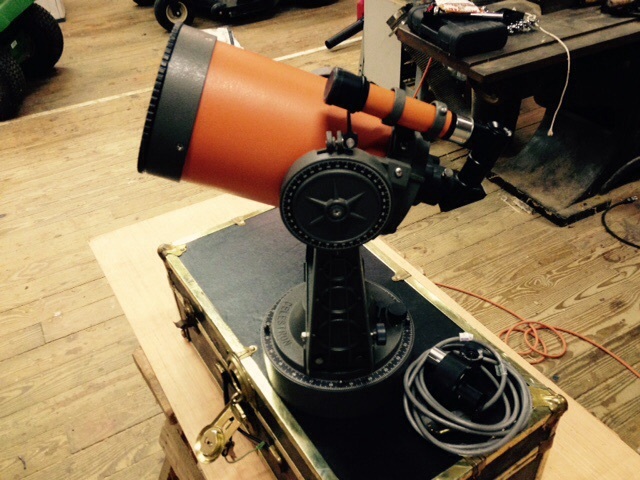 Possibly this telescope was especially selected for some educational projects. For sure, its mechanics are perfectly tuned. And this after 38 years...! 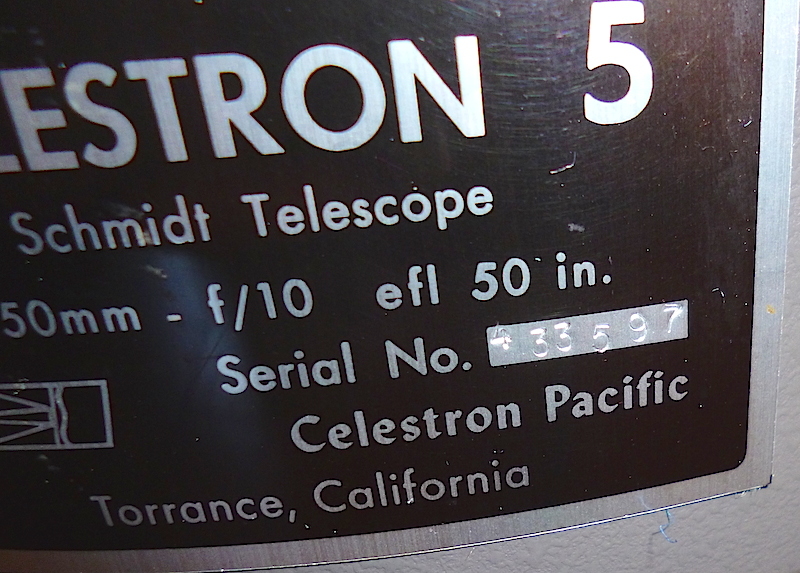 Too bad there was someone at Celestron Pacific doing that stuff at the corrector's orientation -- I am very sure I was the first one opening up the OTA since it left the factory. 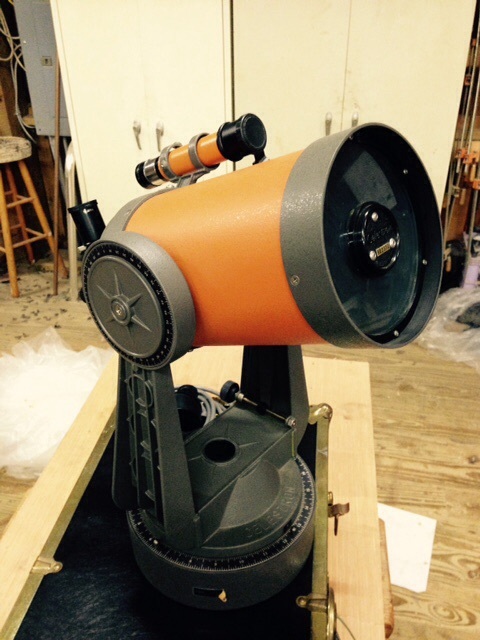 With a bit more care on the optical department side, the people who got to use this telescope before me would have been rewarded by such an excellent quality instead of a seeming astigmatic optics. Ah, one last thing. As it is often the case, a little easy packing resulted in a destroyed finder bracket (the finder was packed separately and is OK). The C5 is currently using my C90 finder bracket. Interesting thread. 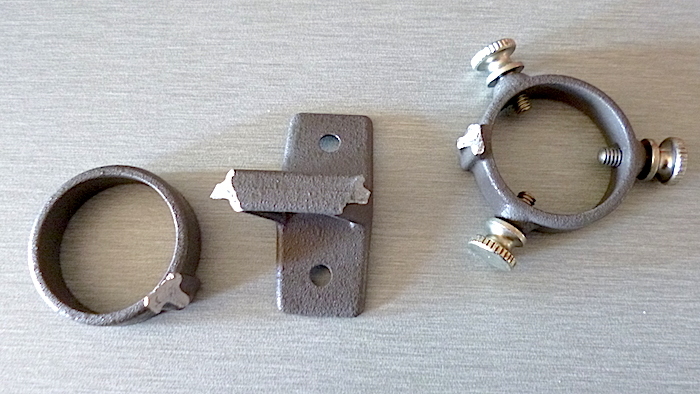 I have a silver-gray goto C5 disarmed from the mount. I'll have to see what the serial number is when I get home.